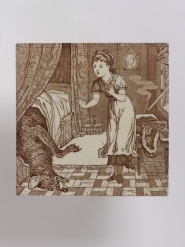 Dust-pressed earthenware tile printed in brown from a set of six tiles with scenes from Little Red Riding Hood. Probably designed by Thomas Allen, formerly at Mintons, and by 1876, at Wedgwood, where he became chief designer and then Art Director. 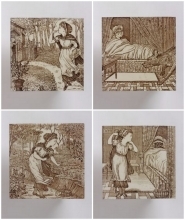 These examples were removed from 180 Queens Gate, London, SW7, a house designed by Norman Shaw. Reference - Batkin, Maureen. Wedgwood Ceramics 1846-1959. London : Richard Dennis, 1982. pp.109, 113.